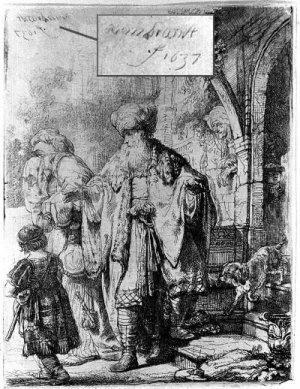 The etching was signed and dated by Rembrandt in the copper plate 1637. It follows that the eleven drawings made from the same recognizable models dressed in the same clothes must have been done around the same time as the etching. However, the eleven drawings have been dated by the scholars according to style, dating them anywhere from 1640 to 1656. The scholars have resolutely kept faith with the stylistic theories of Benesch rather than the proven reality of the group of live models in the studio. They are behaving like medieval theologians in the face of scientific advance. This must be wrong. Common sense suggests that these drawings were all done around 1637. There are many other examples of this flawed system using stylistic analysis as a method of dating Rembrandt's drawings. Rembrandt's art is much too varied to pin him down to one style at any given time. 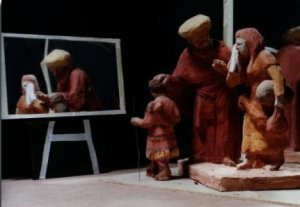 The maquette represents the group of three live models who posed for Rembrandt and his students for the Dismissal of Hagar. On the left you see the reflection of the group in a mirror. - Etching reversed so that we can see what Rembrandt actually drew on his plate. The group was certainly assembled in Rembrandt's studio in 1637 because he made an etching of the subject and dated it on the plate. 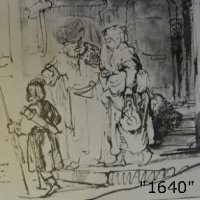 We can see in the etching that the models were wearing elaborate costumes doubtless supplied by Rembrandt from his theatrical wardrobe (there were 92 items mentioned in the inventory when he went bankrupt - 1656). 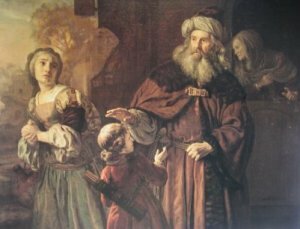 In the painting by Jan Victors we can see that Abraham was wearing the same outfit as we see in the etching. The disposition of the figures is similar but not identical. The group must have been present in the studio for around 6 months at minimum for Victors and other students to complete such large and elaborate paintings. Many of them have found their way into the worlds most important galleries. The scholars would have us believe that the student paintings were done from Rembrandt's drawings, Rembrandt's drawings do not contain enough information to paint from. He himself never attempted to paint from his drawings. The scholars lack studio experience so they do not understand the impossibility of their ideas. Rembrandt's drawings are not the preparatory studies that we find in the Italian schools, they were his way of thinking into the subject. He made more than 20 drawings of the Dismissal of Hagar. 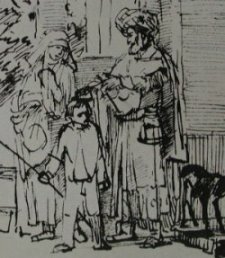 Eleven of those drawings were observed from the same group and from the same seat in the studio as the etching. Some were observed from the mirror seen on the left, others direct from life. 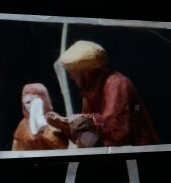 Note that the disposition of the figures match with the reflection, but Hagar's left hand now holds the handkerchief - and the right, the water-bottle and kit-bag! These have been dated by scholars 1642 and 1656. The absurdity of these dates can only be explained by the scholars insistence that the drawings came from Rembrandt's imagination. The scholars do not accept the presence of groups of models. We can assume that the large reflective surfaces were made of polished copper or pewter or from small pieces of glass mounted together. Glass of this isze was not available in Rembrandt's life time. Note the great difference in quality between the drawings made from life and those made from the reflection. Those drawn from the inferior source are comparatively schematic. 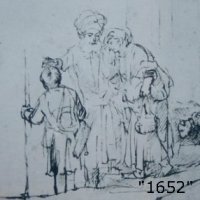 They show none of Rembrandt's subtle sense of materials etc that we have noted in the David drawing and can see again in the “1640” drawing, which comes from direct observation. This difference in quality is surely much better explained by the difference in the quality of the original source of inspiration ( working from life) than by the scholars idea that Rembrandt deteriorated as he grew older. 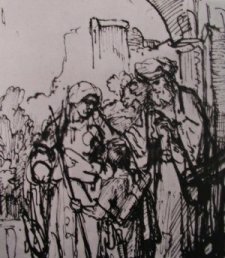 No parallel deterioration is found in his etchings which, unlike the drawings, are dated by Rembrandt himself. ( Age does not necessarily enfeeble. On accepting my article (1976) the editor of The Burlington wrote to me “Scholars must now get down to revising the whole corpus of drawings”. The same goes for the paintings. A very much wider range of quality must be accepted from Rembrandt by scholars in future. There should be a complete ban on dating works by style. For other examples of this drastic change in quality due to the difference between reality and reflection as a source, see my article “ Rembrandt's Use of Models and Mirrors” in the Burlington Magazine (Feb 1977).